We all have to be reminded every so often that business is cyclical. It is nice when things are going well, it makes us feel good, and makes us feel that we have taken all the right decisions. I remember chatting to a client in the depths of the stock market crash of December 2008 and him saying, “Will, we’re going to look back on this moment as the best buying opportunity ever!” He was right, it was a good time to buy and I only wish that I had had more cash available to buy at that time. However, I have little doubt that there will be further great buying opportunities in the future! Some of you may have read Benjamin Graham’s book “The Strategic Investor”, first published back in 1949 and widely credited as being the book on which Warren Buffett bases his investment philosophy. Graham talks about the length of bull markets lasting between 3 & 5 years, the difficulty of course is identifying when you are actually in a bull market and not in a false rally. Still, if your stocks have been going up over the past 3 years it might be worth taking a closer look at the market for signs of increased turbulence, the bull market may be ending. Business cycles are of different durations, in amongst the market noise there are longer economic cycles which can be identified. The most famous long-term analysis of business was done by Kondratieff. This shows the very long-term cycles in the business environment. He described the cycles in terms the seasons with inflation (spring), stagflation (summer), beneficial deflation (autumn) and deflation (winter). 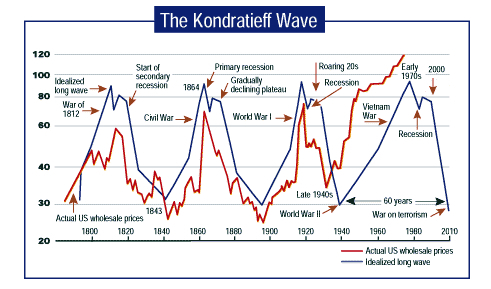 According to the blog Kondratieff winter, we are now entering a long deflationary cycle. Graham, B. (1973), The Intelligent Investor, Harper Collins Publishers, New York, New York, USA.